Sub metering is a system that allows large residential communities, hotels, malls & hospitals to monitor and track their piped hot water usage in various areas. SOLBEAT is an advanced microprocessor based metering device for recording the amount of thermal energy fed to the consumer via heating or cooling systems such as solar thermal systems, heat exchangers, boilers, chilled water and general HVAC systems. The thermal energy measurement is based on the flow volume rates of the heat transfer fluid along with temperature differences between the inlet and outlet of the heating system. A large graphical display screen shows the instantaneous thermal energy in KW, flow and temperature values and the system status. SOLBEAT also logs energy, total flow and temperature data which provide the operations manager with a complete performance analysis of the system. 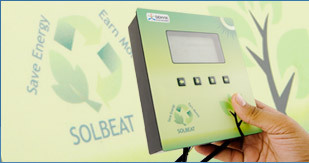 In solar heating systems, SOLBEAT displays and logs the amount of CO2 emissions saved which can be used towards Carbon Credits.